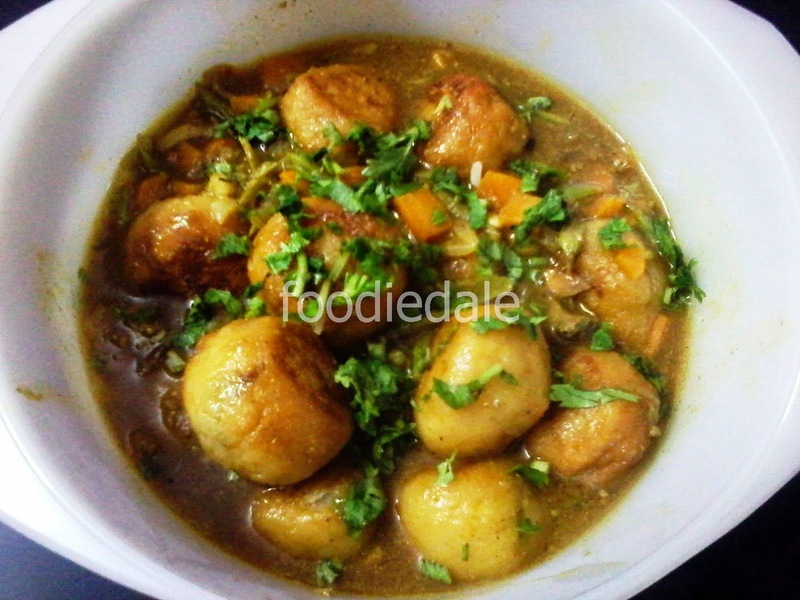 Mix together the potatoes, 2 tbsp corn flour,salt,green chillies,black pepper into a bowl. Heat sufficient oil in a thick bottomed kadai and deep fry the rolls on medium heat until it turns golden brown. Heat two tablespoon oil in a non stick pan ..add chopped onion and saute well and add the chopped carrots and beans and add the ginger garlic paste into it saute it until its raw smell goes and vegetables gets tendered..
Dissolve remaining cornflour into the vegetable stock and add into non stick pan. Once the sauce thickens..add the fried potato rolls and mix it. Now serve hot garnished with coriander and spring onion leaves.